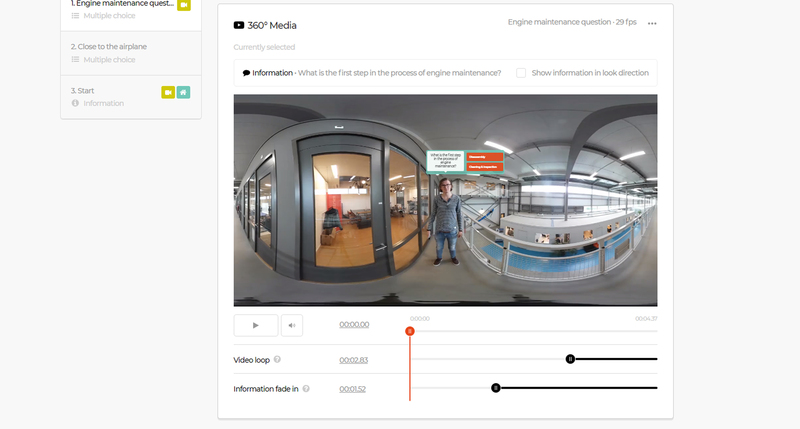 After uploading a 360˚ video file, you can connect it a specific scene. Go to the scene you wish to connect a video to, and click on 'Select 360˚ media' to select your video. After selecting the video, it appears in the '360˚ Media' box. From this point on there are several production tools you can use to control your video. You can position the interactive elements, decide the moment the video should loop and control the moment the interactive elements should appear. Once the video is added to your scene, you directly see the interactive element (or elements) positioned in your video. When hovering these elements with your mouse, they'll show a green background. When you press your mouse, you can move these elements to the position you want them to show in VR. Most elements can be moved around freely. Except for arrows, they can only be moved along the x-axis. By checking 'Show information in look direction', the element will appear at where the trainee is looking at that time while in VR. By default the video will always loop from start to end. By doing this a trainee will never experience a still image while in VR. However you can set the moment the video should be looping. For instance if in the beginning of the video someone is talking, you only want to loop the moment this person isn't talking anymore. When pressing play the moment of looping the video is simulated. Next to the video loop time, you can also set the time when interactive elements should fade in. For instance you only want to show a multiple choice question after something happened in the video. When pressing play the moment of fading in these elements is simulated.